The work, inspired by Robert Venturi's "decorated shed" concept, surrounds the American Academy in Rome’s security shed in a pop textile. The new façade becomes a welcome beacon for the exhibition as well as an experiment in spatial color combination, conferring an alternative view of the pre-fabricated structure and of the Academy’s imposing street presence. The design pairs a rotationally symmetrical structural frame with an ephemeral skin made of 11km of brightly colored acrylic cord. Taking apart the glowing orange tones of the surrounding buildings into six discrete hues, the colors are organized into two planes on each façade, to atomize and create depth in the recombined color. 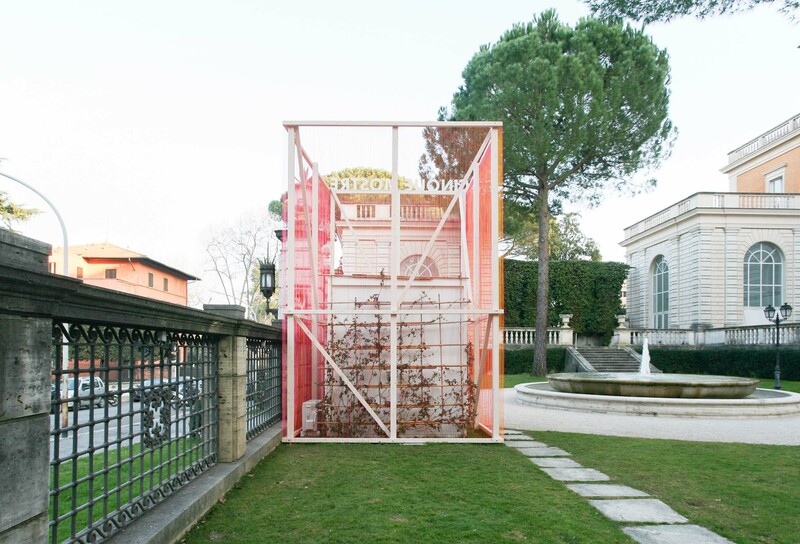 Decorated Shed was part of the 2017 Cinque Mostre exhibition at the American Academy in Rome.